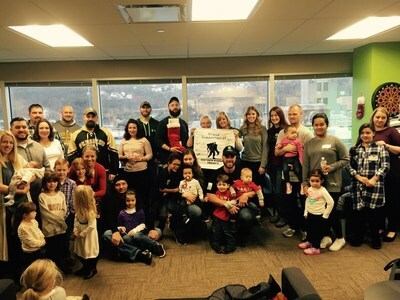 PITTSBURGH, Dec. 30, 2016 /PRNewswire-USNewswire/ -- The holiday spirit was in full force at the Pittsburgh Wounded Warrior Project® (WWP) office, where injured veterans and family members recently enjoyed a winter wonderland gathering. Warriors had the opportunity to connect with fellow service members in their community and learn about various WWP programs and resources. "Connection events allow wounded warriors to step outside, meet new people, and form friendships," said Army veteran Tom Lieb, who attended with his wife. "We look forward to them for that very reason. It creates a sense of community and allows us to enjoy ourselves without having to worry. You know there are people around you can speak to and trust." Families started the day with a group breakfast. Soon after, children crafted ornaments and busied themselves at the candy table. As the kids enjoyed the holiday fare, WWP staff members informed warriors and caregivers about additional services and personalized therapeutic outlets to assist in the recovery process. Once the families got back together, they enjoyed various holiday-themed activities such as taking pictures with Santa, building gingerbread houses, and riding in horse-drawn carriages. The sense of family togetherness and holiday spirit is what motivated Tom and his wife to attend the connection event. "We are expecting our first child soon, so we love being part of the family and couples activities," he said. "It was great gathering with other veterans and having an enjoyable time." These connection activities support the long-term recovery needs of warriors by reintroducing them and their families to the unique bonds experienced during military service – in environments that accommodate physical injuries and social anxieties. In a WWP survey of the injured warriors it serves, more than half of survey respondents (51.7 percent) talked with fellow Operation Enduring Freedom, Operation Iraqi Freedom, or Operation New Dawn veterans to address their mental health issues. Through the generosity of donors, WWP's programs and resources are available to injured veterans and their families at no cost to them. The programs assist injured veterans with mental health, physical health and wellness, career and benefits counseling, and connecting with other warriors and their communities.